Fitness coach Flex Cabral pits Isopure against one of his most intense workouts. Cardio workouts don't have to mean slogging away on a treadmill or stationary bike for hours. 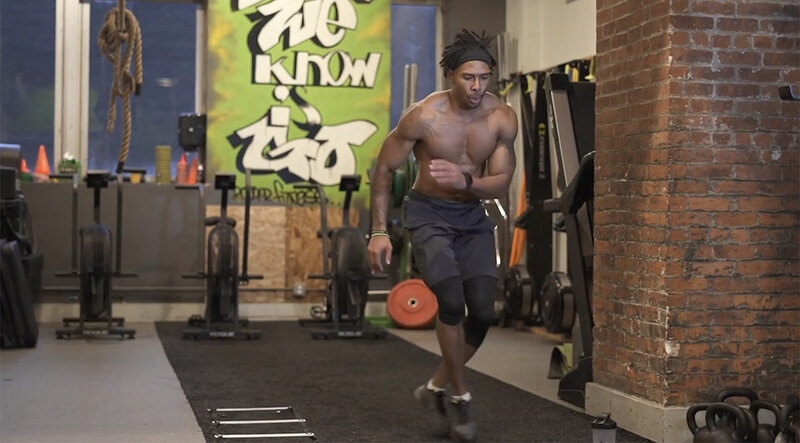 Brooklyn-based fitness coach, Isopure athlete, and founder of Trooper Fitness, Flex Cabral, designed this intense circuit workout to kick the dust off your boring cardio routine. This high-intensity workout uses functional, dynamic movement to keep your body guessing and your heart rate up. But how do you stay cool and hydrated during a workout this intense? Flex tests out Isopure Infusions, the company's latest protein powder innovation, to see how well it holds up against one of his most grueling routines. Flex designed this workout specifically as a cure for your "lame treadmill run." These four circuits require flexibility, coordination, and dynamic movement to boost your athleticism, agility, endurance, metabolism—you name it. A treadmill doesn't stand a chance. It's definitely not for the faint of heart. Drinking a protein powder concoction intra-workout may not sound very typical, but Infusions isn't any typical milkshake-like protein powder. It's a new, light, and refreshing—figuratively and literally—take on the most classic of muscle-building supplements. How did Isopure Infusions hold up against Flex's grueling routine? Check it out. Fueling your workouts is essential, but many protein powders are heavy, chalky, and the last thing you want to drink throughout a dynamic training session. Isopure, the makers of Zero Carb protein powder and Zero Carb RTD, have the solution with their new Isopure Infusions protein powder. This light, fruity protein mix is a refreshing alternative to thick, milky protein shakes. But it still packs a powerful punch with 20 grams of protein from 100% rBST-free whey protein isolate and four grams of BCAAs per serving. Plus it has no artificial colors, flavors, or sweeteners and is gluten and lactose free. These statements have not been evaluated by the food and drug administration. This product is not intended to diagnose, treat, cure, or prevent any disease. Sponsored by Isopure. Visit theisopurecompany.com/.